Your email for the Voting site is a gmail.com address... if you still have access to that, please use https://voting.ipmsusa3.org/user/password to reset your password. Thanks, Eric. I checked my account settings. It didn't show my gmail account. I'll correct it tomorrow. The ballot/survey isn't recognizing my username or password. I checked my login information & reset my password but it still says it's unrecognized. Anybody have an idea what I'm doing wrong? Thanks for the recommendation Ralph & Gil. I'll look into them. Some years ago Aeromaster & Microscale produced letter & number decal sheets. Does anybody know if those are still in production or if another company is doing something similar? The Kinetic E-2C 2000 is sold. Thanks, Rusty. He has a corrected nose for the Kitty Hawk RF-101 and the Heller EC-121 that I would like to have. I guess I'll just have to wait & take my chances. 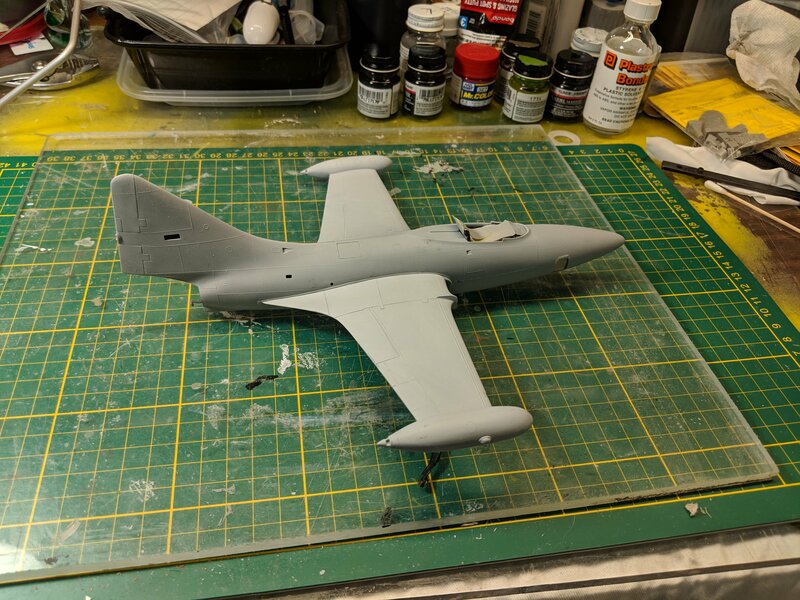 Has anyone successfully ordered from Dmold Modelworks (dmoldmodelworks.com)? Dmitri shows 3 parts I'd like to order but, every time I check the website (which is every few days), they're out of stock. He is responsive to emails but, won't take a pre-order and can't or won't tell me when the parts I'm after will be available. I have 7 1/48th scale kits that will probably never make it to the bench. They include lots of extras but have been removed from the box due to my limited storage space. Send me an email for a detailed list. Add $10.00 for shipping. Packing will include plenty of bubble wrap to prevent breakage. Prices are negotiable. Most of these came from Sprue Brothers. Also have a Microscale 1/48th scale F4D-1 Skyray kit still in the box. The box is damaged but is still in 1 piece. Asking $50.00. I have 7 kits I'll probably never get around to that I'd like to sell. Two questions. 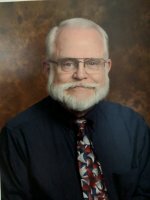 Is it ok to list them for sale here on the forum? If not, can somebody recommend a website (other than ebay) or other option? The main problem is that they're no longer in the box and most of them have lots of add-ons from Eduard, Wolfpack Design, or other resin companies. I'm with Ron. The only date I see with the events is December 31 1969. I'm using Chrome as my browser. Looking forward to your review, Dave. I'm hoping they come out with newer versions. 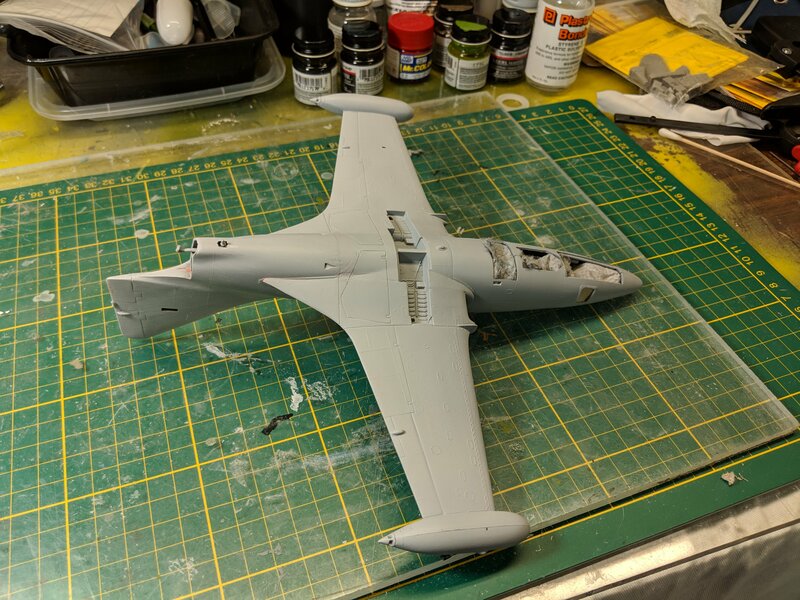 Caracal Decals already has a sheet available for the U-2R/S. I'm looking for a scanned copy of the Chip Jean T-33 Article in the Jan/Feb 2012 Journal. If any of ya'll have that issue & would be willing to email it to me, I would appreciate it. I was assigned to the 48th FIS from '83-'85 and spent many hours in the back seat of our T-birds shooting pictures of our F-15's. Now I have the Great Wall Hobby & the old Hawk/Testor's T-33 kits to build & would like to have a copy of the article for detail information. email address is nicksr1125@gmail.com. Looking at the instructions this morning, I noticed an interesting mistake. The sprue drawings on the back page show sprue F (the Trimetrogon camera) twice. Unfortunately, there is only 1 F sprue. Would like to have 2 sprues. The camera set would make a nice kit all by itself. 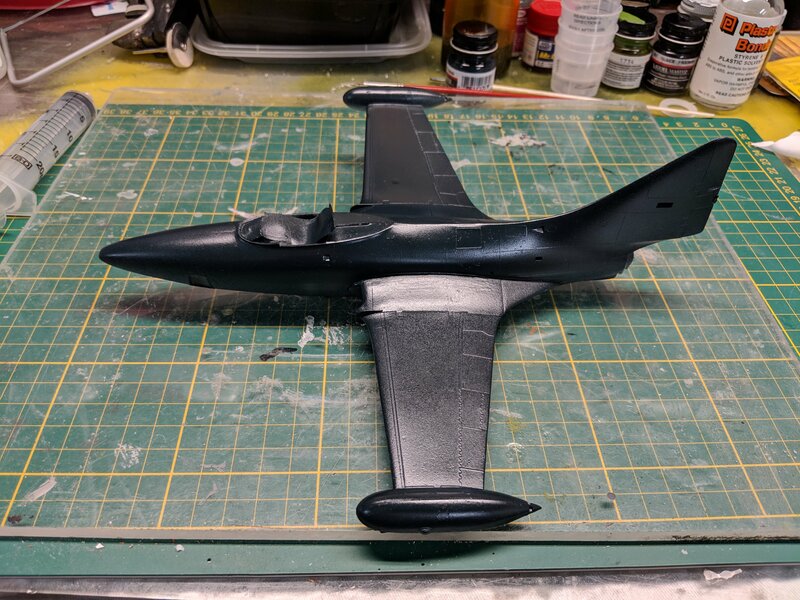 Got my kit of the AFV U-2A Dragon Lady today. 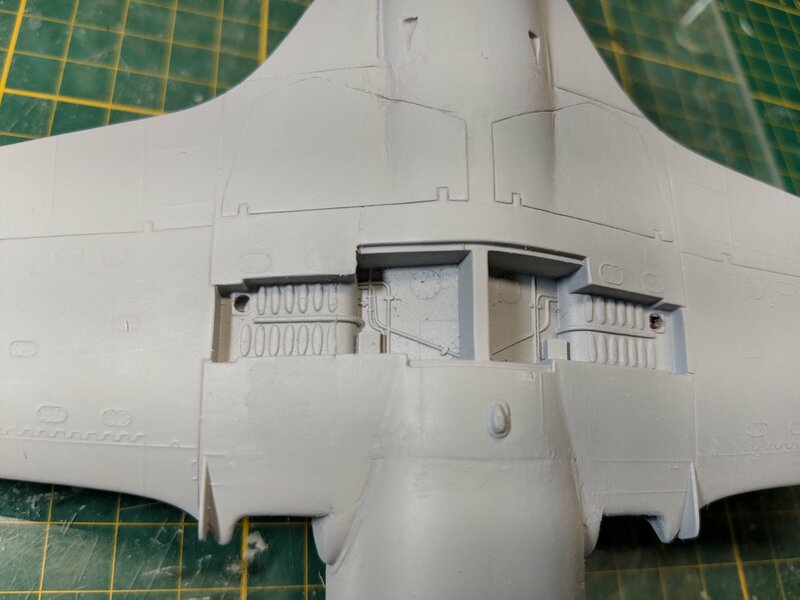 From the reviews I've read online there are some inaccuracies in the canopy, nose, & intakes. That's okay. It looks like it will make up into a very nice model. There is an extra cockpit tub & Q-bay cover indicating there may be more versions in the works. I'd like to see at least a U-2C & TR-1/U-2R. What makes this kit really sing to me is the inclusion of a full camera set including the trolley and the canopy cover. The only negatives I've noticed is the canopy cover doesn't show any fabric texture. The few times I saw a U-2 during my Air Force career it looked like the canopy was made of canvas fabric which has a fairly heavy texture. It would have shown very nicely in 1/48th. Secondly, the instrument panel is only a piece of clear plastic. There is no decal to put on the back to show instrument faces. While this kit is fairly far down on my build list, I"m looking forward to working on it. Hope Eduard or some of the other resin parts companies come out with some goodies for it. Have any of ya'll tried Press & Seal to mask areas of a kit when you're painting a kit? It has low tack & looks like it would be quite useful to mask larger areas. Where did you get a "sealed" exhaust fan from, in case you use volatile lacquers or enamels? The 1st shot shows the complete prototype & ducting. The 2nd shot is the completed new booth. Lookin' good. I have both the Eduard Mig-21MF & Mig-21R kits in 1/48th that I'm looking forward to building when I work down to them. Have all the PE & Resin to go with them. The fan is rated at 110cfm from Lowe's. I don't think it's sealed but, have been shooting enamel thinned with Mr. Color Leveling Thinner for a couple of weeks with no problem. Now I'm going to have to check Lowe's website to see if it is sealed. 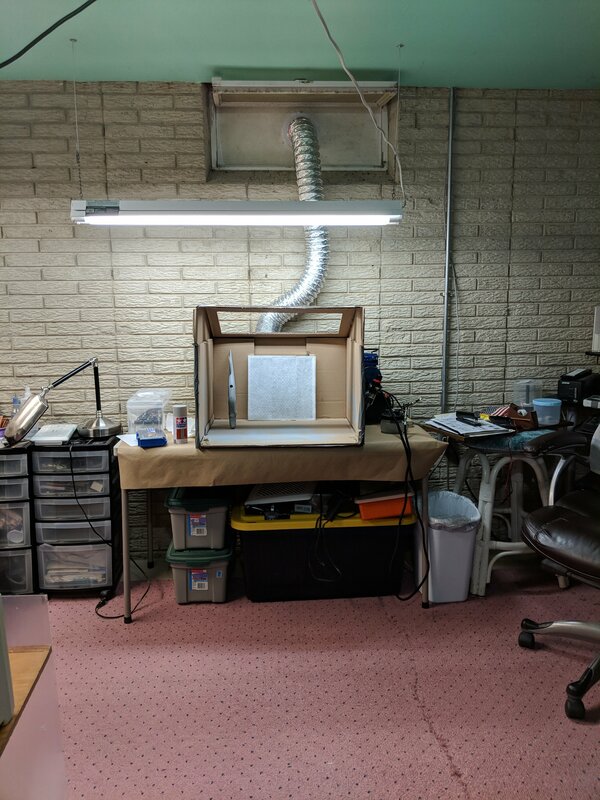 For too many years I've had to do airbrushing in the garage which limited me to warmer weather and enduring dust problems. 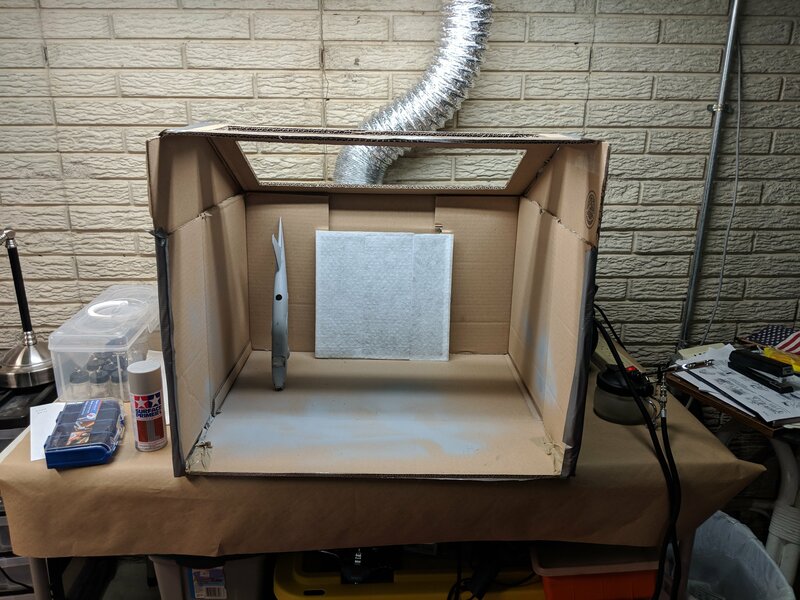 After looking at spray booths on Micromark.com, I decided to build my own. The 1st shot is the prototype made from large cardboard boxes. The 2nd shot is made from 3/8" plywood. 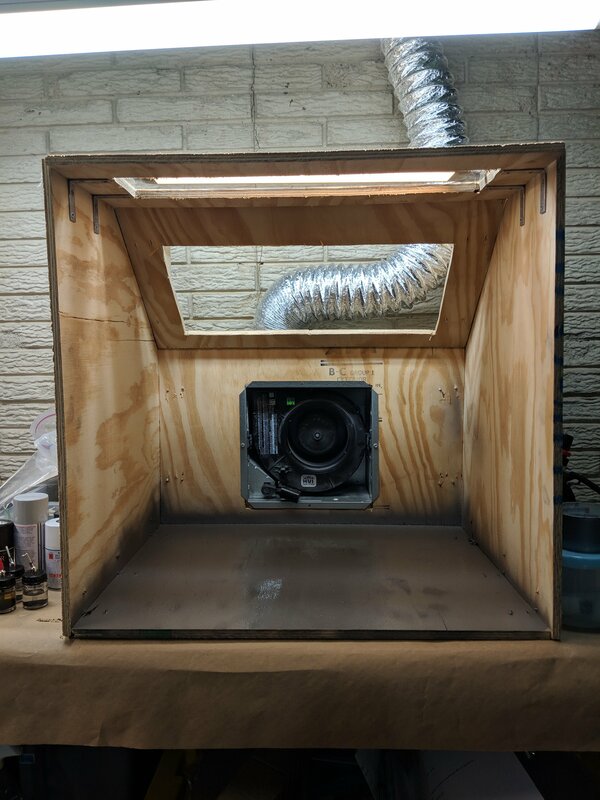 I haven't cut holes for the fan or illumination. The box is approximately 24" square but, only 19" deep. 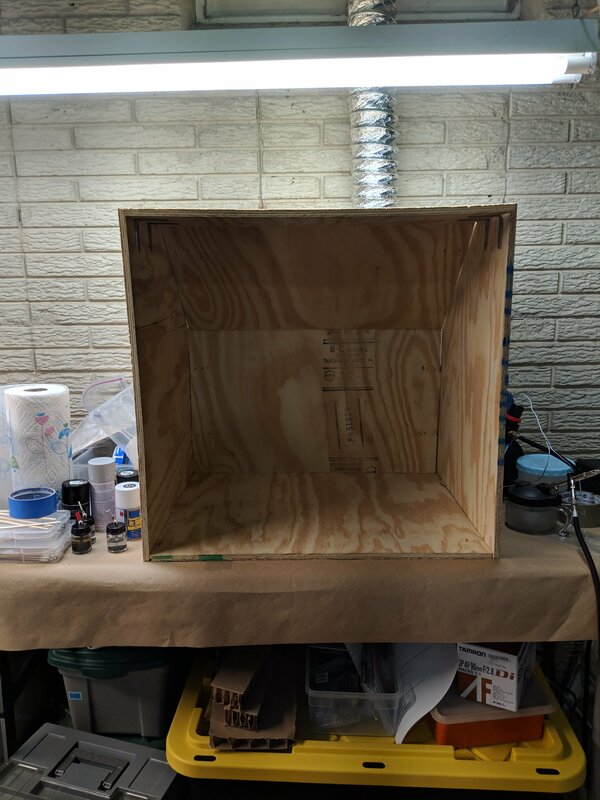 I left the sides & bottom the full length to protect the exhaust fan which would stick out about 4" in the back. I can send the list of materials & dimensions if anybody is interested in building their own. Lowe's cut the pieces. I'll cut in the windows & fan hole. More progress. I missed Gil's recommendation of Tamiya white primer before spraying blue. 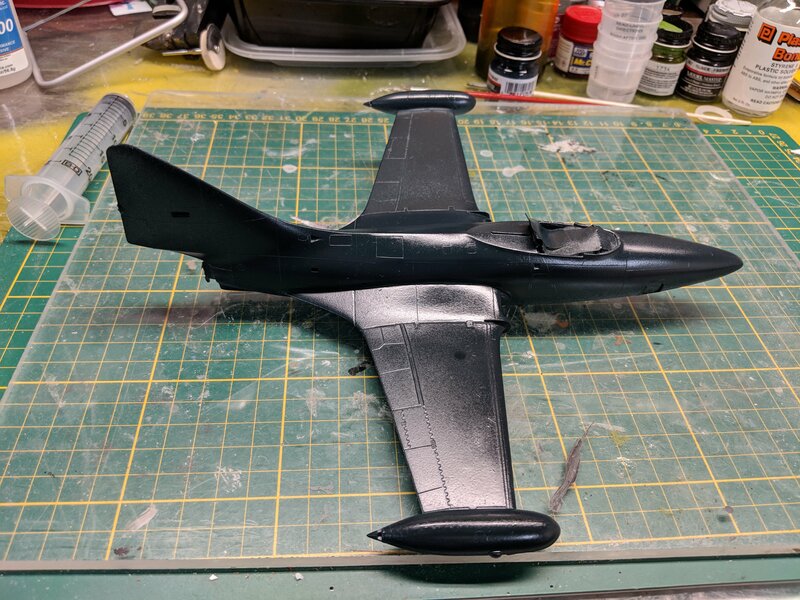 Next kit on the docket is the Kitty Hawk F2H-2P. I'll remember to use the white for it. Experimenting with Mr. Color Leveling Thinner. Thinned MM Dark Sea Blue 2 parts paint to 1 part thinner. Looked extremely thin. Dropped the pressure on my compressor to 12 psi & moved the needle a little further forward. Guess it's been too long since I've done any airbrushing. The topside will need another coat & a couple days drying time before I shoot the bottom. The Panther project is making progress. Some Bondo, sanding, & another coat of primer have it just about ready for a coat of Dark Sea Blue. Hopefully that will happen Saturday. The cut through the port wing root, while not invisible, turned out a lot better than I had expected. Thanks for the comments Gil. I'll remember about the add next time.